We thought we better show you whats under the bonnet, how we use power through the car and what storage solutions we have inside the Paj. These were the last major projects done on the Paj but they made a HUGE difference to our enjoyment of camping and think we would struggle without both on our treks. 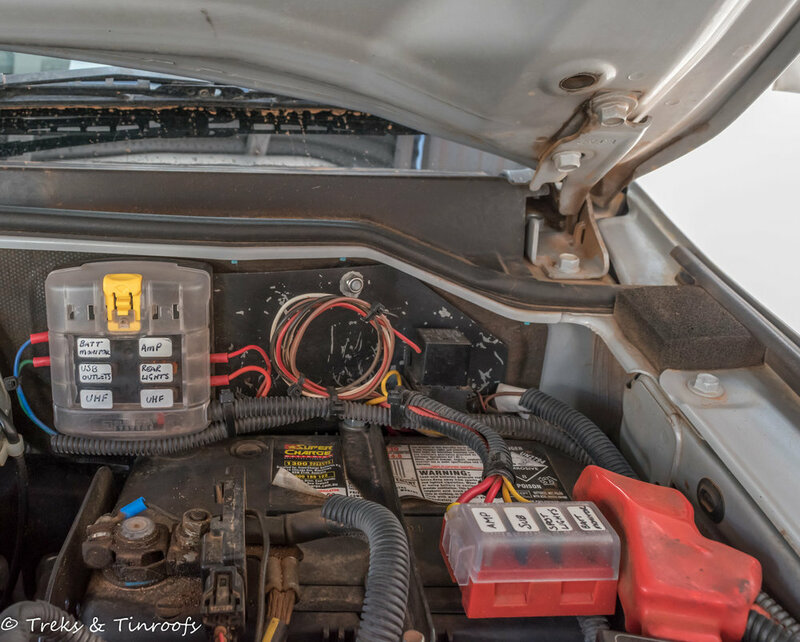 We fitted an auxiliary battery where the original battery was and the original battery was moved onto a secondary battery tray under the bonnet. We have a fuse box wired to the starting battery terminal that supplies power to the spotlights, battery monitor and stereo components. 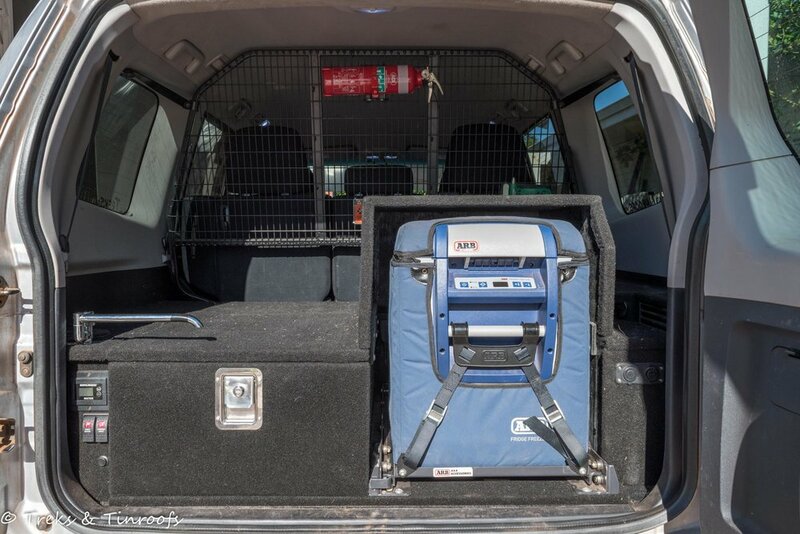 A second, larger fuse box mounted to the firewall is fed by the aux battery supplying power to our roof rack mounted rear lights, USB charging sockets in the dash and UHF. A third terminal mounted fuse box on the auxiliary battery feeds power to the rear of the car for our fridge and various other bits and pieces. The two batteries are isolated by a Redarc isolator, we can make sure both batteries are being charged by having a look at our dual battery monitor, mounted in the glovebox. Mounted to the bull bar we have a pair of Lightforce LED spotlights. These provide a reasonable mix between traditional spotlights and modern LED light bars. Their lack of distance is obvious on night time highway driving but the spread is very useful at slower speeds or amongst the tight turning roads amongst the forest in the South West of our state. We don't do much night driving so these are a pretty good compromise for us. At the rear of the Paj on the roofrack we have a pair of LED spread lights for night time 4wding and to help set up camp. We find these a little too bright at camp and will be looking into a more subtle rear light options, however they are still useful for navigating tight tracks at night time. Moving into the boot area, we have found that organising our storage in this vehicle has been a slow process. It took nearly 3 years for me to decide on what to do in the rear, including me changing the design multiple times while building it. Having now used it for a range of trips there are things I would change if I built another one, but it's part of the learning process and I'm happy with what we have already. What we ended up with is a storage unit that houses a drawer on the passenger’s side on heavy duty slides and our fridge is mounted on a fridge slide on the driver’s side. 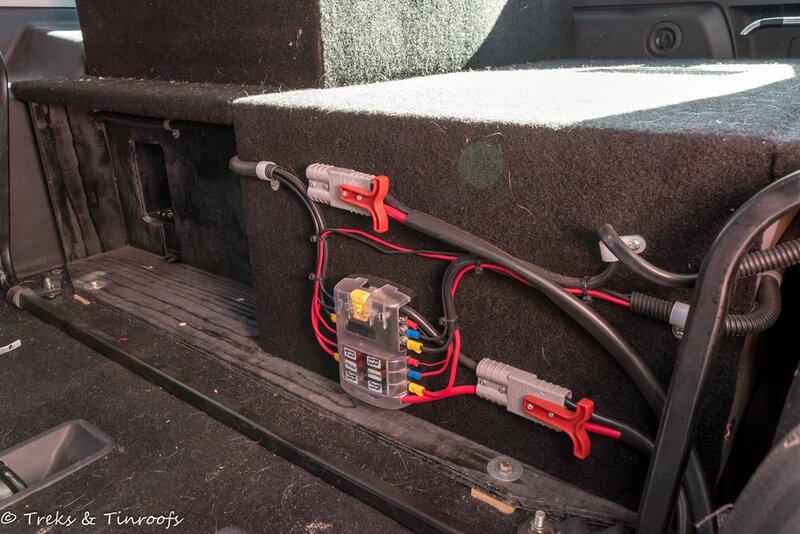 Hidden on the front face, behind the seats is where power connects from our auxiliary battery into a fuse block. We have 2x USB charging ports and 3x cigarette plug sockets for various charging and power requirements. From these we can charge phones, tablets, various camera batteries and we can power camp lights, shower pumps and any other 12v gadget. We removed the rearmost seats which left us with a large cavity of space under the drawer. We fitted a custom built water tank into that space along with a water pump, filter and flow meter, finishing with a tap on the passenger’s side of the drawer unit. The flow meter is fantastic as once you fill the tank you reset it to your pre-set tank's volume (55L for us), it then counts down exactly how much water has been pumped through the flow meter. Rather than seeing "half a tank" which isn't exactly accurate, we can see the exact amount of litres left. In front of the drawer set up we have a Mitsubishi cargo barrier for our safety. It also is the perfect spot for us to mount a fire extinguisher in the boot and the wireless fridge thermometer display. Our electrics and storage aren't the most glamorous, they are very unassuming really but once you set up for camp or find beautiful spot to pull in for a rest they come into their own. It doesn't matter how wild or mild your 4wd is, the creature comforts and easy organisation afforded by 12v power and drawers makes the world of difference. The whole point of it all actually enjoying where you are, right?